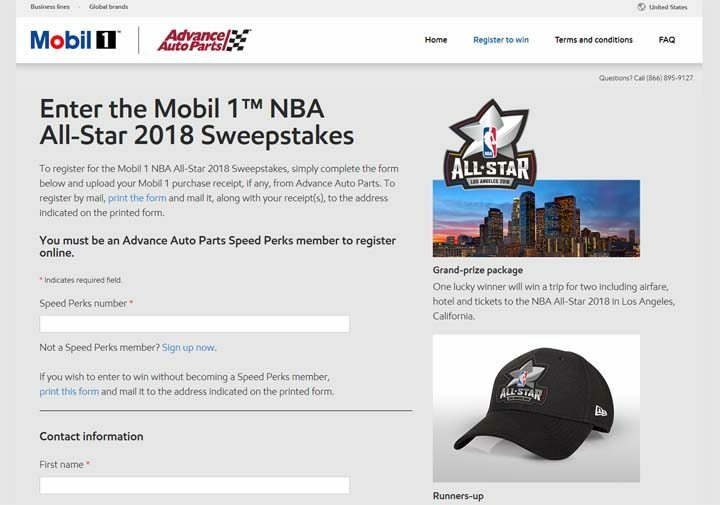 The Mobil 1 NBA All-Star Sweepstakes is open to all legal residents of the fifty (50) United States and the District of Columbia who have reached the age of majority in his or her state, or territory of residence and are at least 18 years of age or older. The Mobil 1 NBA All-Star Sweepstakes ends at 11:59:59 PM ET on August 30. Online: To enter via the internet, complete the electronic entry form located at mobil1.us/NBAAllStar2018sweepstakes. Limit one (1) online and one (1) bonus entry per person, email address, or Speed Perks number. Automatic Entry: To receive an automatic entry, complete a purchase of five (5) or more quarts of any Mobil product from Advance Auto Parts/CARQUEST and present your Speed Perks membership information with the purchase. Limit one (1) automatic entry per person, email address, or Speed Perks number. Mail-In: If you do not wish to enter via the Internet, you may enter the Sweepstakes and receive one entry by hand-printing your full name, address, city, state and zip code, day and evening telephone numbers, e-mail address (optional), and Speed Perks number (optional) on a 3″x5″ postcard and mailing it in a #10 sealed envelope with proper postage affixed to: NBA All-Star 2018 Sweepstakes c/o Arrowhead Promotion & Fulfillment Co., Inc., PO Box 2354, Grand Rapids, MN 55745-2354. To receive a bonus entry by mail, enclose proof of purchase showing a purchase of five (5) or more quarts of any Mobil product from Advance Auto Parts/CARQUEST. Limit of up to one (1) entry per outer envelope, and three (3) mail-in entries total via this method of entry. Only three (3) entries into the Sweepstakes per person, per mailing address, mobile phone number, email address or Speed Perks number. One (1) Grand Prize – A 3-day/2-night trip for winner and one (1) guest to Los Angeles, CA for NBA All-Star in Los Angeles, CA between February 17-19. Trip includes round-trip coach air transportation from a major U.S. gateway airport nearest winner’s residence to Los Angeles, CA for winner and one (1) guest, two (2) nights hotel accommodations, two (2) tickets to State Farm All-Star Saturday Night and the NBA All-Star Game, and $500 spending money awarded in the form of a gift card for the winner only. Approximate Retail Value (“ARV”): $5,000.00. Two-hundred fifty (250) Second Prizes – An NBA All-Star 2018 Hat. ARV: $16.50 each. Total Prize pool ARV is $9,125.00.